The majestic temple of Lord Shree Jagannatha at Puri is said to have been built by emperor Anangabhimadeva, historically identified as Angangabhima III belonging to Ganga dynasty. Some historians are of opinion that the construction was commenced during the reign of emperor Chodagangadeva, the founder of the dynastic rule in Odisha. It is described in Madala Panji, the temple chronicle of Puri that Anangabhima contemplated to construct a temple of Srivatsa khandasala type with 100 cubits in height. But on the advice of the ministers and royal priests, the height was reduced to 90 cubits. Accordingly the temple was built, as it stands today. Babu Manamohan Ganguly has measured the height of the present temple by theodolite method and has concluded that it is 214 feet 8 inches. The temple consists of four structures called (a) the Vimana or Bada Deula sanctum sanctorum) (b) the Jagamohan or Mukhasala (the porch), (c) the Natamandir (the audience hall) and (d) the Bhogamandap (the hall for residuary offerings) built in a row in an axial alignment in east-west direction. The temple faces the east. The Vimana is constructed in Pancharatha (temple containing five Pagas or segments) Rekha order. Rekha is the name given to a type of temple with a curvilinear spire. Out of the five Pagas or segments, the middle one is known as Raha, the two flanking pagas as Anuraha, and the two corners as Kanika. Like a full-fledged Odishan temple, it has four-fold vertical divisions, i.e. the Pitha (pedestal), the Bada (wall), the Gandi (trunk) and the Mastaka (the head). The temple stands on a high pedestal though a major portion of it is buried in the ground. The visible portion shows three mouldings, which are richly carved. Similarly the Bada is Panchanga type i.e. consisting of five elements known respectively as Pabhaga (foot), lower Jangha (shin), Bandhana(bond), upper Jangha and Baranda. The Pabhaga consists of five usual mouldings and these mouldings are connected with vertical bands in each Paga of the Bada. These five mouldings are known in the architectural texts as Khura, Kumbha, Pata, Kani and Basanta in ascending order. The Khura is shaped like a horse hoof and contains inverted leaf designs with dotted borders. In each Paga it has a Kirita design and figures of royal personnel, The lower portion of Khura has been decorated with Vanalata designs and other types of scroll work. The Kumbha is designed like pitcher. The Kani is plain, but the Pata and the Basanta are richly carved. The sculpted friezes of the Pata depict procession of various animals: mostly war-animals intervened by procession of foot soldiers with the general sitting on a palanquin and giving certain directions. The Pata also displays a sculptured panel containing episodes from Gopalila of the Bhagavata Purana. The vertical band, as aforesaid contains rich scroll-work and two female figures one above the other. The programme of the Raha Paga is different. It contains large niches for the Parsva-devatas on different sides. The southern niche contains the Varaha incarnation, the northern niche houses the Trivikrama image and the western niche shows the Nrsimha form of Vishnu. These three images are made of chlorite and are very exquisitely carved. While Varaha holds the goddess earth in his upraised left arm and a club in his right hand, karrsimha is depicted in a ferocious form. The latter is seen as taking out the entrails of Hiranyakasipu, the demon king, with two of this hands, while his other two hands show his usual attributes. In the image of Trivikrama of Vamana, the God is seen as placing one of His feet set firmly on 28 Shree Jagannatha Culture the ground, while the other stretches upwards. All the three images have trefoil-shaped designs in the background. In front of each of the three images of side deities, small covered halls with a Sikhara (tower) of Pidha order have been constructed, which are called Nisa temples. These structures are plain and sometimes cover the sculptural beauty of th e temple. The upper portions of the Parsva-devata niches depict Dopichha lions (lions with one front and two hind portions), Naga-nagi pilasters, Kanyas and one central image on each side, which is difficult to recognise due to existence of the Nisa structure. The Gandi or the body of the temple proper, consists of ten Bhumis or storeys. At the Kanika Paga of each Bhumi, there is a Bhumi Amla connected with six Bhumi Barandis ( courses of stone) and Chaitya medallions are seen carved on them at intervals. The Anuraha Paga of each side is filled with three Angasikharas, i.e., miniature Rekha replicas with rich carvings. In the Rah.a Paga, however, there is .a large Vajramastaka at the base, which is a usual feature with most of the Odishan temples. Above the Vajramastaka up to the height of the Gandi, rows of Chaitya medallions with intermittent spaces appear with five such medallions in each rowin the frontal Raha Paga (eastern side) there is a bigger Angasikhara at the Sandhisthala (joint of Vimana and Jagamohana) surmounted with a projecting Gajakranta, i.e, lion-on- elephant. Such Gajakrantas also appear on three other sides in the Raha above the Vajramastaka. A smaller projecting lion also appears on each side of the base of the Gandi. The Mastaka consists of the usual elements of Beki (neck), Amalaka (an Indian fruit of the same name a little flattened), Khapuri (skull), Kalasa Uar) and Ayudha (weapon, i.e, Cakra). In the Beki are inserted four figures of Dopichha lions at each corner, while on the front sides there are images of Garuda. There are nothing specific regarding the other elements of Mastaka, except that the weapon is called Nilachakra, the shape of which is peculiar in Odisha as well as its name. The interior of the Vimana is entirely plain. It is called sanctum sanctorum or Garbhagruha and in the middle of the room there is Ratnasimhasana on which the images of worship have been installed. The throne is about four feet high and there is a path for circumambulating the throne. There is only one door leading to Jagamohan. The temple was plastered with a thick coat of lime sometime in the l6th century A.D. to protect its surface from decay caused by saline wind. Quoting some temple records, Rajendralal Mitra says that the application of lime plaster was done for the first time during the reign of Prataparudra Deva on both the Vimana and J agamohana. Madala Panji records such plastering to have been done in 1647 A.D. Thereafter successive plasters had been applied in 18th century for which, the temple looked like’ an ugly mass of stone and plaster’ as observed by A. Sterling. The famous exponent on Indian .architecture James Fergusson, being unable to find detailed carvings on the body of the templeassumed that the art of Odisha had received a total downward impetus which Rajendralal Mitra has efuted with very strong arguments . But after the conservation of the temple has been handed over to the Archaeological Survey of India in . 1975, removal of the plaster has been taken up and so far deplastering the Vimana is almost completed, for which the above detailed description of the sculptural art of Vimana could be made possible. Deplastering of Jagamohana is yet to be taken up. 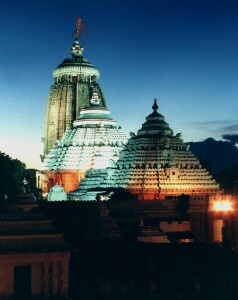 The Jagamohan or Mukhasala is a Pidha temple, i.e., a structure with pyramidal roof. It consists of Pidhas or horizontal platforms receding in size as they go up-wards. The Jagamohana seems to have stood on a Pitha or platform like the Vimana, but its traces are not visible owing to later constructions. The Bada is Pancharatha in plan and consists of five usual elements. But the details of carving on the Mundis or miniature temples and the niches of the Mundis including the images therein can not be seen due to application of plaster on them. It is also not possible to know the decorative motifs, the sculptural arts, the mouldings in different elements and even the architectural design due to such heavy pleasteiing. But the Gandi is made of thirteen Pidhas arranged in two Potalas or tiers of seven in the lower and six in the upper diminishing in size as these proceed from bottom to top. The Kanthi recess in between the Potalas is decorated with Pidha-mundis, pilasters and images of Mandiracharini. In each side and in each of the two Potalas there are miniature Pidha Mastakas surmounted by Udyata lions, the lion in the upper tier being larger than of the lower. The Mastaka consists of the usual elements of Beki, Ghanta, Amla Beki, Amalaka, Kalasa and Ayudha, which is a disc. 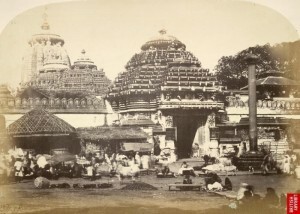 The roof of Jagamohan stands on four square,pillars. It has two gates, one leading to the south and the other to Natamandir .The latter is considered as the main entrance. It is known as Jaya Vijaya gate, but the images of the Dvarapalas. Jaya and Vijaya are conspicuous in their absence. The door frames of both the gates are ornately decorated with different kinds of floral designs and Naga- Nagi figures. Navagraha figures adorn the upper architraves. Figures of Brahma and Siva on the southern gate are more prominent. Scholars are tempted to believe that the Jaya-Vijaya gate (main gate of Jagamohan) was reconstructed at the time of the construction of the present Natamandir. The Bhogamandap (earlier Natamandir), is a Pidha deula with a high pedestal. The pedestal consists of five divisions. But the elements do not confirm to the specifications given in the architectural texts of Odisha, I though these are richly carved. Rather there. is a similarity tbetween this structure and the N atamandu of Konarka temple in Odisha. Depiction of Krusna’s entire lifestory : at the top of the pedestal in a row is quite striking. The projections in the Bada portion are not quite prominent, but the profuse ornamentatiop of Bada adds to the grandeur of the structure. There are figures of Rama Abhiseka, rowing of boats, Jagannatha-Mahisamardini- Sivalinga worship, Siva in Tandava dance posture etc., carved on separate chlorite slabs. Besides there are several more chlorite figures in different places of the Bada. The Gandi shows a Pidha order with three Potalas. The Potalas consist of five, four and three Pidhas as we count from the bottom. Huge figures of projecting lions appear in each Potala. The Gandi is Pancharatha in plan like that of Jagamohana. The Mastaka is composed of the usual elements, except that a brazen pot is placed on the top of fit. The structure stands on four pillars and the interior is left entirely undecorated in contrast to the exterior decoratations. It has a flight of steps to the north. It is believed that a similar flight existed in south side too, but due to construction of the gangway from the kitchen to the Jagamohana, the steps had to be removed at a subsequent period. The present Natamandir appears to be a relatively later structure standing on sixteen pillars. Rajendralal Mitra feels that it was originally a structure on eight pillars and subsequently it has been expanded with addition of eight more pillars. Its roof is flat consisting of four layers of stone slabs. The hall is presently used for offering of prayers. A monolithic pillar with the image of Garuda at the top stands towards the eastern part of the hall. The interior of the hall is well decorated with different types of stucco images and paintings. Scenes depicting the Kanchi -Kaveri expedition of Jagannath and Balabhadra and the ten incarnations of Visnu, with an image of Jagannath as the ninth incarnation are more striking. The hall has two main gates, leading towards the north and the south besides two subsidiary openings. Scholars say that the Vimana and the Jagamohan of the temple were originally constructed by Anantavarma Chodaganga Deva and the other two halls were added later. Rajendralal Mitra says that the Bhogamahdap was constructed during the Maratha rule of Odisha ( 18th century) by an architect named Bhaskar Pandit with an expenditure of about 40 lakh rupees in a period of 12 years, with the materials brought from the Sun-temple of Konark. He goes the extent of informing that the entire structure was dismantled at Konark, brought to Puri and reassembled in the present site. But Madala Panji ascribes construction of Bhogamandap to Purusottama Deva. Donaldson opines that the Natamandir was constructed in the 13th century while the Bhogamandap in the 15th century A.D. by Purusottama Deva. The view is not acceptable, as Bhogamandap appears to have been constructed first, though there may not be a great difference in the period between the construction of these two structures. In fact, a standard Odishan temple consists of a Vimana and a Jagamohana. In the words of Dr. Debala Mitra -II Architecturally, the temples resolve themselves into three broad orders, known to local terminology as Rekha, Pidha and Khakhara. In a typical Odisha temple, the first two go almost side by side and form two component parts of one architectural scheme. So inOdisha the sanctum and the porch have almost become synonymous with the Rekha and Pidha temples respectively, although originally these names were meant to denote the particular type of the structure. Odishan architectural texts also recognize such identification as pointed out by N .K. Bose on the basis of some such texts prevalent in Odisha. It has been stated that the Rekha temple is the male and the Bhadra or Pidha, a female and the joint (Sandhisthala) is called Gainthala, a knot tied in the garments of the bride and bridegroom at the time of marriage. Several additions and alterations have been carried out in the temple and works of such modification seem to have commenced not too far from the dates of original construction of the temple. To the original twin structure of the Vimana and Jagamohana, the first addition seerns to have been the present Bhogamandap, a little away from the temple and the hall was intended originally as Natamandir , i.e, the hall meant for dance and music. Addition of the hall, presently known as Natamandir was done subsequently by joining the Jagamohan with the present Bhogamandap. Interestingly, the Natamandir is popularly called Jagamohan, because in this hall the devotees assemble to offer prayers to Jagannath and no dance and music are. performed at present and it is used as audience hall, in addition to the original one. It is presumed that at the time of the construction of the present Natamandir, the original Jagamohan underwent a lot of changes (a) the balustraded windows on the south and north were removed, (b) on the north an extra-room (presently Ratna Bhandar, i.e., the store of jewels) was built and (c) the southern window was completely demolished to convert it into a door. Another notable addition is the gangway connecting the kitchen with the Jagamohana via the present Bhogamandap and Natamandir, to facilitate carrying of food offerings for the deities. The gangway entirely covers up the southern side of the Bhogamandap, the original carvings of which are still visible through its southern door. This gangway is stated to have been constructed by Gajapati Harekrusna Deva (1716-1720 A.D.) of Khurda. Besides, a number of subsidiary Shreenes have been constructed within the premises of the temple over the years and some such Shreenes and other minor structures partly cover up the northern side of Bhogamandap. Such modifications and additions may also – be seen on both sides of Natamandir and Jagamohan as well, without any planning. Some of the modifications appear to have arisen out of necessity in connection with theperformance of certain rituals within the precincts of the temple. Donaldson informs that such additions and alterations have been carried out down to the Maratha period in the 18th century A.D. The temple is enclosed by two compound walls, thus forming two enclosures, the inner and the outer. The outer compound wall is called Meghanada Prachira, since the sound of the waves of the ocean do not enter the temple premises by penetrating the walls. The inner compound wall is known as Kurma Prachira, named after a tortoise owing to its shape. There are four gates on all four sides in both the walls. The main gate is called the Simha Dvara or the lions gate, because of the two huge statues of lions in front. There is a propyl at the eastern gate from which start a flight of twenty two steps to reach the inner compound wall. The outer enclosure consists of the kitchen (south-east), the Ananda Bazar or the market for the Mahaprasada (north-east), and gardens including the Koili Vaikuntha, Niladri Vihara, besides a few essential structures like Snana Vedi and a few subsidiary Shreenes as well. The inner enclosure is filled with a number of subsidiary Shreenes and various other structures utilized in connection with the observance of various rites and festivals. Devotees circumambulate the temple within the inner enclosure and seek ‘Darsan’ of the minor deities in a prescribed manner, after which they enter the main temple through the northern entrance of the Natamandir.